Let me start by saying how truly blessed I am to work in a company where diversity is taken seriously and protection of those with ADA compliant disabilities is a real thing. Diversity is not just about gender, ethnicity and such. It is also about things like disabilities. But truly, all the differences that make up society, can be seen at the company at which I work. If you are living with a chronic condition, you need any employer where the culture is supportive and where they understand that just because you are living with a medical condition, it does not dictate who you are. I have just such an employer and am again, truly blessed. I want to take a minute to provide examples of how my employer and other like this, are helping and can helpful to those with disabilities. First, I have never been held back because of my condition. I do let people I work with know about the condition because it is important. Those around you need to know if you have a condition that is not immediately evident. They will know if something changes that can alert them to a change in status. This is really important in the case of epilepsy where a seizure can be happening and there be no physical sign. I have a job that requires a bit of travel. Services such as ride sharing have made this possible for me. I get to cities in which otherwise be unsafe for me to drive. I can use ride sharing services to get around. Before this, there were cabs but ride sharing is more accommodating in many cases. Many of the trips I take for work involve going out for meals and such. There are some nights I feel like I can go and stay out for dinner but there are others when I know that is not wise. I have never had co-workers pressure me or make me feel like I am losing out because I do not go. I am not one who drinks alcohol and again, never pressure for such. Matter of fact, my co-workers know what I like and some have been known to bring me back dessert (which is always the highlight of my meal). There is always work to do. In a recent class I was in, I was asked to rank from one to five, five being the best, how our company dealt with Respect of People and Culture. I was able to proudly say 5. Not everyone agreed so while there is work to do, I think the great majority in the room agreed with me. This is important stuff and it deserves the attention of leaders in every company. If you are working in a workplace where there are people who do not accept your situation or your condition or where you feel you are being discriminated against because of that factor, you should exit if at all possible. Use and all protection which the law may allow. If on the other hand, you are fortunate enough to be in a company where diverse situations are celebrated, consider yourself blessed. This entry was posted in General on December 5, 2017 by Tony Angle. 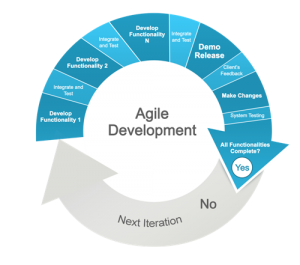 Agile development seems to be all the rage. Everyone thinks that agile has a special power and ability to get things done. If the business is not ready for and agile project, it will not help, it will actually hinder. Change Management is a huge subject all it’s own and includes preparing the business for the changes being made in, not just an agile project, but in any project. But making sure the business is ready for an agile project is one of the most important items you do in preparing for an agile project. I had one business partner say to me, ”I want you to take my requirements and go away and complete my project.” They were serious. It took a great deal of time to explain that agile does not work that way and we do not work in a waterfall manner any longer. I actually said, “the 90s called and wants their methodology back.” Looking back, I could have handled that better, but I was serious. Whether it is sending the business people for agile training or bringing in an agile training team or coach to begin the process, you really have to make sure the business understands the requirements that will fall on them for an agile project. Gone are the days when the business would take a passive role in a project, IT or a vendor would build for 6 months (or more) and come back and reveal the result. In this 6 months, the business had a chance to think about things, to look at other software products and to consider what they had asked for compared to the current business climate. In many businesses, 6 months is actually a lifetime. Business must be agile and be ready and able to adapt. So goes the project. So what is the requirement on the business? What do you need to tell the business you need from them for a successful project? TIME. This is the part that most business people do think understand about an agile project. As a project leader, you need their time and a lot of it. This is not a meet once in a while type arrangement. In agile, the business has a place at the table not just as a status receiver, but as a player. The business makes up part of the agile team. The product owner, from the business, is part of the agile team. The product owner, his or her support staff, are at the table, making decisions as the development team is at the table listening. This is a loop for feedback, knowledge sharing, understanding and more. In the beginning, the business will look at you like you have one eyeball in the center of your forehead. They will absolutely not understand what this agile thing is all about. They want to be an agile business but do not understand what that requirement means on the technology side. You have to bring them along on the agile journey. If your company has an Agile COE, they can assist you in getting the business educated on what agile means and more importantly, what it means to the business. If you do not have an Agile COE in your organization, consider outside educated resources. It will be well worth your investment. This entry was posted in General on November 20, 2017 by Tony Angle. It has been said that implementing Salesforce is a Journey and I must agree. Working with the platform in an enterprise starts small, maybe in one department, but quickly grows to other areas and capabilities. As demand grows in these other areas, sometimes outside your direct area of expertise, you need more information from people who have experience with the platform in those disciplines. Vendors can be your answer to this requirement. Vendors come from all walks of life and have varied experiences which you can use to your advantage. You can make use of various SIs and AppExchange partners. Remember, if you need a capability, make sure you look at the AppExchange first, someone else has more than likely had that same need or a similar need before. Vendors, such as SIs, provide the experiences in your vertical and beyond to help you navigate the subject area in ways you have possibly not considered. More importantly, the right vendor can challenge your current way of thinking and possibly help you find a better way to complete the task. Another advantage to having a solid vendor relationship, is lowering the pain factor. When you start into a new initiative, there are pitfalls you will run into. The vendor, if experienced, will know of these pitfalls and help you navigate around them. Having internal expertise on your team is important, but having the outside view, from someone who has already been there, is priceless. Vendors can be expensive and their flexibility in this area will be limited. But one thing you must always keep in mind, is you are not necessarily paying for the resource to hit the button. You are paying for the experience these companies have had and their ability to translate your requirements into the solution you require while lessening the pain. Keep in mind as you go through the journey, it is not about having or not having knowledgeable staff who know and understand Salesforce. The Salesforce ecosystem is full of other resources that have more experience than you most likely have in-house that can help make you more successful with less pain.